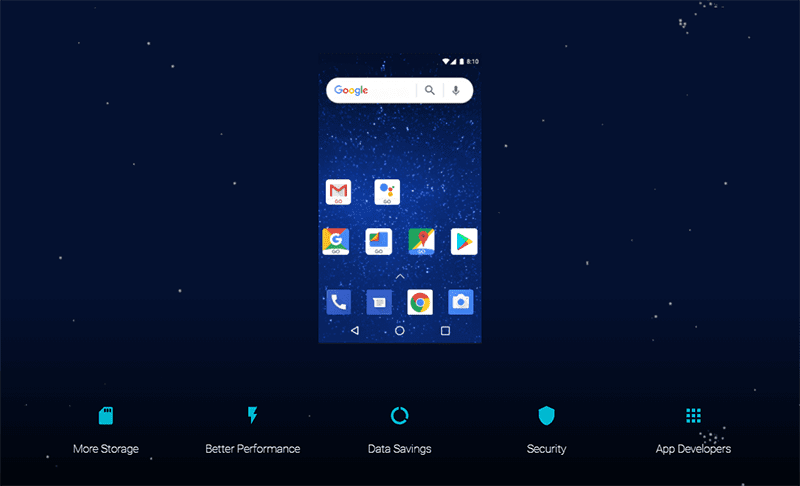 Earlier this year, Google announced Android Go, a lightweight version of Android Oreo designed to work w/ lesser hardware, limited network, and smaller data plans. Today, Google made the Android Oreo (Go edition) officially available for device manufacturers and developers. Basically, the Go edition will make Android Oreo run better on smartphones w/ 512MB or 1GB RAM. As we all know, to make Android run smoothly on devices, RAM should be 2GB or higher. In comparison, most midrange phones have at least 3GB or 4GB RAM these days. It'll also have fewer pre-installed and much lighter apps to let users get 2x more available storage out of the box. In addition, Google has "Go" versions of popular Google apps like: Google Assistant, Maps, Gmail, YouTube Go, and etc. For YouTube Go, it has special features which allows you to download videos over WiFi. These "Go" apps are obviously smaller in size (half actually) which doesn't take much storage on your phone. Google has also added data-saving features out of the box. For example, in Google Chrome, TheVerge reported that everything will get run through a Google server that reduces file sizes before it gets delivered to your phone. The new Datally app for tracking data will also be there. It also has the Files Go, a new app from Google, created to help you quickly find files and get rid of any unwanted content. The future Android releases wont'be quite delayed versus the full ones on the Android (Go edition).